The ALL NEW Panterra 130 ID is geared for expert level skiers. The Panterra 130 design incorporates many of the structural and performance features of the popular Krypton construction and adds a sturdy and precise Ski/Hike cuff lock for supreme versatility. Also, a hi-grip rubber midsole and replaceable toe and heel are offered on the 130 to provide extra traction and durability when hiking. Dalbello’s 3 Piece Cabrio design provides responsive and consistent flex with tenacious lateral and rearward power. Contour 4 Fit Technology allows for a close anatomic fit while accommodating the typical hot-spots many skiers encounter while the VFF Fit System enables quick and precise forefoot width to be adjusted via the toe buckle. Center Balanced “Rocker” Stance allows skiers to take full advantage of their equipment by centering their body mass over the sweet spot of their skis for more power and control with less effort. Available with ID Thermo "MAX" Custom Fit Liners (medium density) are incredibly lightweight and comfortable, and provide exceptional warmth and shock absorption. Bootfitter’s Comments: The boot that skiers and boot fitters had been crying out for! Dalbello finally bring their massively popular cabrio design in a package that suits a wider foot. With a full custom liner, hike mode and adjustable forefoot width, this is great option for high-performance all-mountain skiing. Bootfitter’s comments: A slightly more forgiving flex and liner than the 130, but still a serious performance boot. Versatilee, powerful and adaptable, whether on the frontside or in the backcountry. Replacing the popular Aspect 100, the Panterra MX is a versatile, high-volume boot for intermediate to advanced skiers who need a wide fit. The cabrio construction makes getting in and out of these boots a breeze, and the walk mode offers increased comfort whether you’re hiking the peaks or the car park. Bootfitter’s comments: An ideal option for those with wider feet and high insteps, the roomy fit of the Panterra MX 100 is geared towards all-day comfort, while the smooth 100 flex will suit anyone from first-time boot buyers to lighter or less aggressive advanced skiers. Bootfitter’s comments: An evolution of the bestselling free ride boot from Tecnica. The new Cochise features an updated shell shape for a more precise fit and stronger power transfer, as well as an overhauled walk mode and the introduction of integrated tech inserts for universal binding compatibility. Love the look of the new black Cochise 120? Put it on your feet, add samurai sword and conquer mountains like a master Ninja. Triax 3.0 plastic combined with our new Power Light Design and Self Adjusting Mobility Cuff brings tons of game with less baggage to carry. Quick Instep combined with our new light weight Lift Lock buckles will help make getting in and out of these boots a breeze. The fit, performance and lightweight characteristics of this boot will allow you to push your limits to last chair while leading your shred posse. Bootfitter’s comments: A hard-charging all-mountain freeride boot. The Cochise 120 features a lightweight but laterally stiff shell, and Tecnica’s customisable CAS liner. Walk mode and interchangeable soles for backcountry functionality. The Cochise 100 turns the hope of conquering your mountain into your new reality for an incredible value. Advanced skiers will love this 100 flex offering that comes with the same Power Light Design constructed 99mm lasted shell and C.A.S. UltraFit liner as its big brother the Cochise 120. Take advantage of Tecnica's new S.A.S. Cuff Mobility System either hiking around the resort, walking back to the local shop or cruising to your go-to apres scene. Bootfitter’s comments: Softer flexing than the Cochise 110, but still retaining the lightweight shell and anatomical last shape, the Cochise 100 is a great option for those looking to take their first steps into the backcountry without making any compromises on downhill performance. The Challenger 130 delivers pure alpine performance with supreme comfort and Ski-Hike adjustability. This boot is packed with technology that allows a rider to customize both the fit and performance. Features include the uncompromised support of our Power Ski-Hike Mechanism, fine-tuning of Spineflex buckles and Double Power Levers and width changing Adaptive Fit Technology. Finally a conformable Perfect Fit PRO liner generates both perfect foothold and exact synergy between liner and boot. Bootfitter’s comments: A high-performance boot with a medium/wide fit, the Challenger 130 features a precise 4-buckle design and powerful flex for expert skiing. The ski/walk mode adds versatility for those looking to explore beyond the pistes. The all-mountain Challenger 110 delivers supreme comfort and robust binding-activated auto ski and hike modes with uncompromised downhill performance to advanced skiers – its about challenging perceptions. The boot’s unique balance of fit, function, comfort and superior handling is made possible through a cocktail of complementary technologies that include a conformable line, form fitting buckles, a Velcro strap for enhanced power and rebound and an adjustable width last. This boot is built for all-day precision skiing in all terrains. 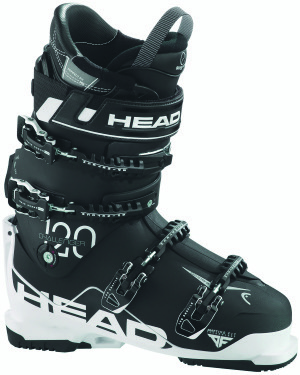 Bootfitter’s comments: A more accessible Challenger model from Head, the 110 flex allows a wide range of skiers to get the most out of this boot. The walk mode functionality, generous forefoot fit and easy-entry design make this a usable, versatile boot for all-day, all-mountain skiing. Bootfitter’s comments: The Strider Pro represents Nordica’s first foray into building a boot with full touring capabilities. A few of our bootfitters have been testing these throughout the spring touring season in 2017, and have been very impressed with the solid downhill performance and hiking functionality of these boots. The 100mm shell shape, cork-fit liner and Infrared shell moulding technology offer a personalised fit for all day comfort. Bootfitter’s comments: K2’s BFC is one of the highest volume boots in our range, making it a great fit for those customers with extremely wide feet. We’re delighted to be able to offer the BFC’s supremely comfortable fit in a stiffer flex, allowing more avanced skiers to enjoy it! Bootfitter’s comments: Brand new from K2 this season, the B.F.C. features a new, high-volume last shape, hands-free entry, and a walk mode for comfort and convenience off the hill. The 100 flex will work well for improving intermediate skiers looking for a boot to use all over the mountain. For those who suffer from cold toes, the new heated liner option is a must!